Clayton Thorson scans the field. The junior quarterback passed for a career-high 370 yards against Bowling Green. 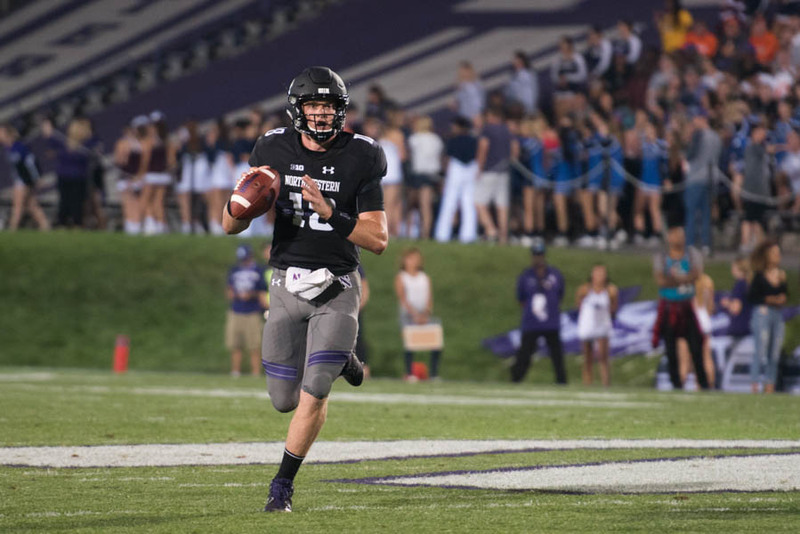 Seven days after falling at Duke in the most lopsided non-conference loss of coach Pat Fitzgerald’s tenure, Northwestern (2-1) thrashed Bowling Green (0-3) 49-7 under the lights at a humid Ryan Field on Saturday. The Wildcats responded by flexing their offensive muscle against the Falcons, as junior quarterback Clayton Thorson scorched Bowling Green for a career-high 370 passing yards and senior running back Justin Jackson rolled up 121 yards on the ground. The win should provide NU with a much-needed confidence boost following the 24-point loss a week ago and an uneven season-opening victory against Nevada. NU’s new students ran onto the field pregame as part of the annual Wildcat Welcome festivities. Many of them, who joined an announced crowd of 33,706, left by intermission with the Cats boasting a 35-7 lead. The hosts owed that advantage to a trio of rushing touchdowns and a pair of touchdowns tosses from Thorson to sophomore wide receiver Ben Skowronek. After the game, Fitzgerald praised Thorson, who bounced back from an 11-of-29 passing performance against the Blue Devils. Thorson’s strong outing powered the offensive explosion. After the Cats’ first possession sputtered out after six plays, they scored on five straight drives spanning most of the first and second quarters. Jackson skedaddled for a five-yard touchdown midway through the first period to give NU its initial score. On the next possession, Thorson connected on a deep ball down the sideline to Skowronek for a 58-yard touchdown that broke a 7-7 tie. After the turnover, NU’s offense again struck quickly: Thorson hit Skowronek for an 18-yard touchdown on the first play of the drive. The score put the Cats up 21-7, and they rolled from that point. NU’s defense displayed some holes early, as Bowling Green racked up 10 first downs in the first half and 81 yards on its first-quarter touchdown drive. But Fitzgerald described the defensive performance overall as “really good,” and the Cats clamped down on the Falcons for the rest of the game. The offense still stole the show, rolling up 678 yards and approaching the program’s all-time best of 704. Thorson found particular success targeting Skowronek and senior superback Garrett Dickerson, who posted career highs with nine catches and 150 yards. The dominant performance propels NU into a bye week before its Big Ten opener at No. 10 Wisconsin on Sept. 30.